A complete set of products featuring our black and white cow with a huge personality! The complete 6 product bundle for “Black and White Cow” contains a colourful 21cm x 25.4cm book with song CD, AND “Moooo” the 21cm lovable cuddly soft plush cow toy, PLUS two 3D animated videos (one has the lyrics onscreen as a singalong version) and also the mp3 song to download and own! This is a unique combination of matching products for that ultimate sensory visual, audio and tactile sensory experience for children – and they are all together for you at a great price. Easy read-aloud story with hilarious illustrations and large print for grandparents! Many customers have bought – and loved – this “total experience set” as a newborn gift because parents get value and use right from newborn stage – new babies love hearing a story from a book or hearing a song – through to toddler cuddling the plush toy cow (a favourite bedtime cuddler), then later experiencing the song and book come to life with the videos which match! Children love this cow with personality and the adventures she gets up to – by the final page she is a soggy, smelly, sneezy, ringing, swishy, noisy, dirty, munchy, itchy, black and white cow! Lots of extra fun such as….. find the Butterfly hidden on each page, or look for the shapes on the barn, count the haystacks, try to predict the new word added with each clue given, or simply enjoy reading through the story. Look for suggestions on our website about how to use the complete set for extra fun and learning opportunities – see the menu “Tips and Ideas”. Your copies of the two animation videos are also free of the ads and this means that you can play them easily on your devices anytime and offline! 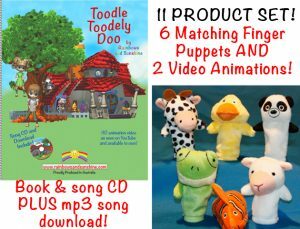 Adding to our range of “complete sets” is the just released “Toodle Toodely Doo” – an exciting 11 PRODUCT SET, complete with 6 super cute finger puppets…….